These counterculture-inspired, conversation-starting earrings is a functional piece of paraphernalia. The 1920s were a time of delicious excess, sharp Art Deco design, and lively lifestyle changes. Some changes were more "organic" than others, picking up steam in the 1960s and continuing to spark opinions--and even new laws--today. Roach clips--metal holders designed to keep smokers from burning fingers on an almost-finished joint--were high in demand during the counter-culture revolution. Portland, Oregon-based metal smith and jeweler Erin Rose Gardner draws on inspiration from these two decades that brought so many social and political changes. 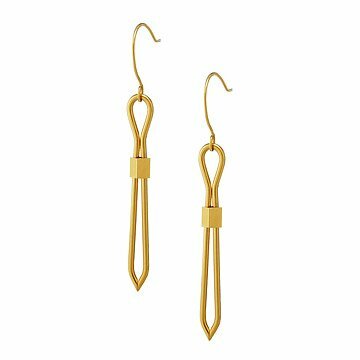 As an homage to times gone by, and the recent resurgence of the pot movement, she created this sleek set of earrings—both an elegant relic and a functional accessory, should you find yourself in legal territory. Offering a working slide mechanism and lustrous 24k gold finish, these earrings are beautifully hand hammered on an anvil and serve as true conversation starters. Now stick that in your pipe and smoke it...or don't. Handmade in Portland, Oregon.